Program: Corwin Jones will demonstrate his method for sphere. 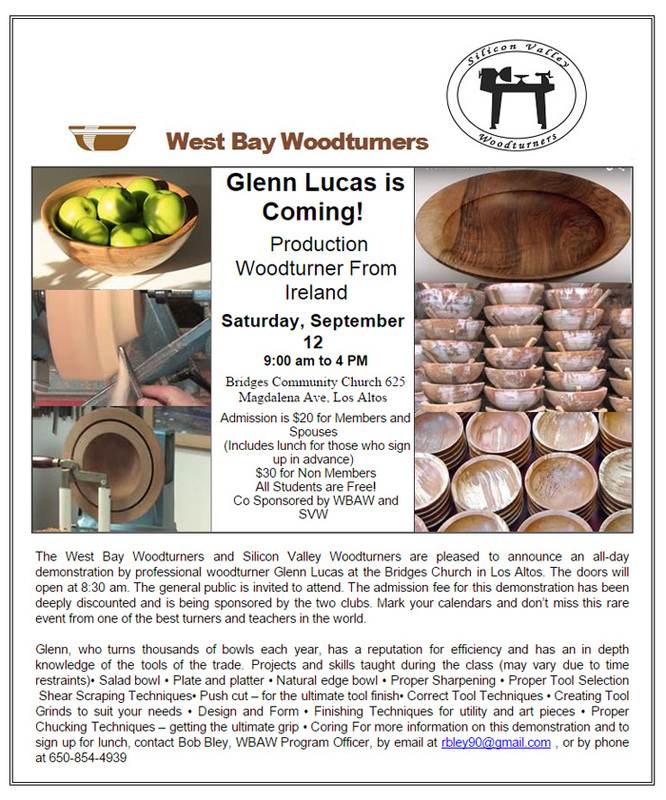 Demonstration: Glenn Lucas is coming on Saturday, September 12! This will be an extraordinary demo, don't miss it! August BBQ a great success! The August barbeque was a great success. Jim Laflin was again our host. Larry Maggi cooked and was it good. There were three lathes set up to turn tops and turn tops we did. 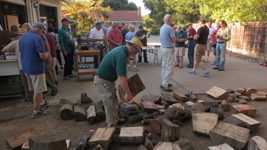 There was a wood raffle and a tool silent auction with plenty of each. Some walked away with great turning wood and nice tools. I don't turn a lot of bowls each year, perhaps 12 to 15 at the most, and often they are small bowls that are never finished because they were used to test a tool or show a student how to turn a bowl. I seldom apply any decoration to a bowl, but occasionally I do get an urge to try something different. This story is about such an occasion. Nearly two years ago, I had rough-turned and cored a nice 10 inch maple bowl. I decided to finish it and do some form of decoration on it. 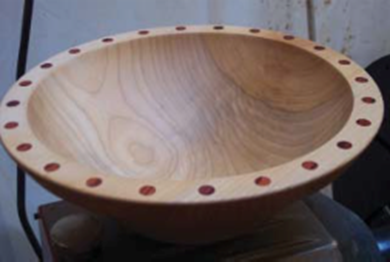 The decision was to put a circle of 24 dots of a contrasting wood on the top of the rim of the bowl. So, when I finished turning the bowl, I left the top of the rim wider than I normally would. This was shortly after I acquired one of Richard Benham's Rim Chucks so I tried using the Rim Chuck to turn the foot of this rough turned bowl to fit my Nova Chuck with large jaws. The bowl was a bit warped on top and somewhat out of round; however, it fit nicely into the Rim Chuck so I could turn the foot to fit my chuck (see the photo) below. I never trust any of the reverse-chucking devices completely and normally give additional support with my cup-shaped live center as shown in the photo. Using a Rim chuck to turn the foot of my rough turned bowl. With the foot turned to fit into the chuck, I mounted the bowl in the chuck and final turned the outside and the inside. Incidentally, I used the cup-shaped live center to support the bowl in the Nova Chuck also. This allows more aggressive turning without concern of losing the bowl from the chuck. 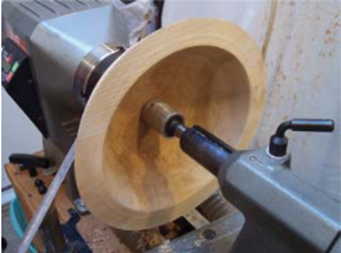 Turning the outside of the bowl when mounted in the Nova Chuck. 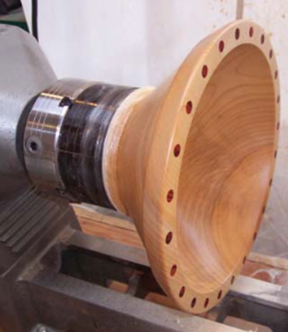 This cup-shaped live center doesn't mar the bowl's surface when used as support for the chuck. I used some reddish colored wood that we had in inventory. I don't know its name because it came from a scrapped-out crate. So I just call it "Crate Wood". This board was 3/4" thick. 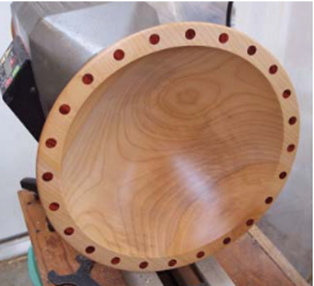 I used a plug cutter to cut enough plugs to fill 24 holes around the rim of the bowl. 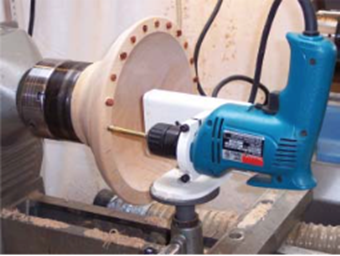 I then used a Forstner Drill in the Oneway Drill Wizard to drill the 24 equally spaced holes, the maximum indexing positions on my Nova DVR 3000. Actually, I glued in a plug each time I drilled a hole. The glue used was Tite-Bond 2, which is the glue that I use almost exclusively. I’ve never had a glue joint fail with this glue, which is a good reason to continue its use. Drilling the 24 equally-spaced holes with the Oneway Drill Wizard and my 3/8” drive drill motor that had to be purchased to fit the collar of the Drill Wizard. Once the glue was dry, I turned away the tops of the plugs, finish-sanded, and applied finish to the inside and outside of the bowl. A view of the bowl from the side after sanding and finishing. 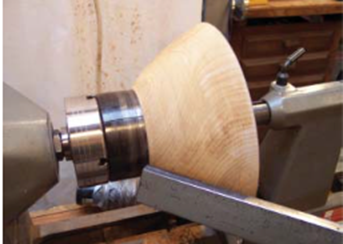 A view of the top of the bowl while still mounted on the lathe. The bowl was now ready to reverse and turn the foot. I would have normally reversed the bowl onto my vacuum plate made by Vicmarc that I've had for a number of years. However, the Rim Chuck was easier to set up and worked very well. 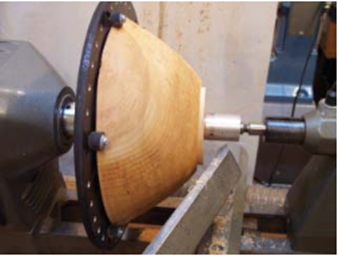 Again, for safety sake, I used tailstock support; something that I do with any reverse turning method, whether it is a jam chuck, a vacuum chuck, a Longworth Chuck, or the Rim Chuck. 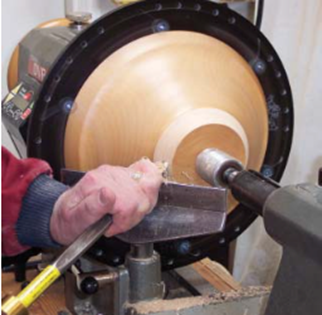 Turning the foot of the bowl. The tailstock was removed for final turning away of the little tenon in the center and for final sanding. I was pleased with the bowl and so was the person who purchased it. If you haven't tried decorating one of your bowls, perhaps it is time that you gave it a try. This was a very simple method, but only one of many ways to enhance the appearance of a fairly plain piece of wood. Give it a try. Well...did you like the article? If "yes", there may be more. We need your opinion to make that decision.